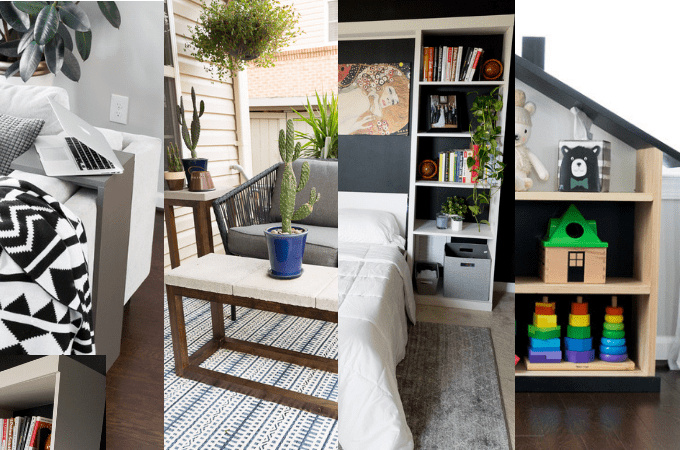 This post is sponsored by Kreg and Kreg’s new DIY project plan website, BuildSomething. Thanks for helping me make my new garage a more functional place to work! This project is also featured in 30 Builds to Put Your KregJig to Work. To save some money. They really don’t tell you to factor approximately $1 million dollars extra into your home buying budget for incidentals. 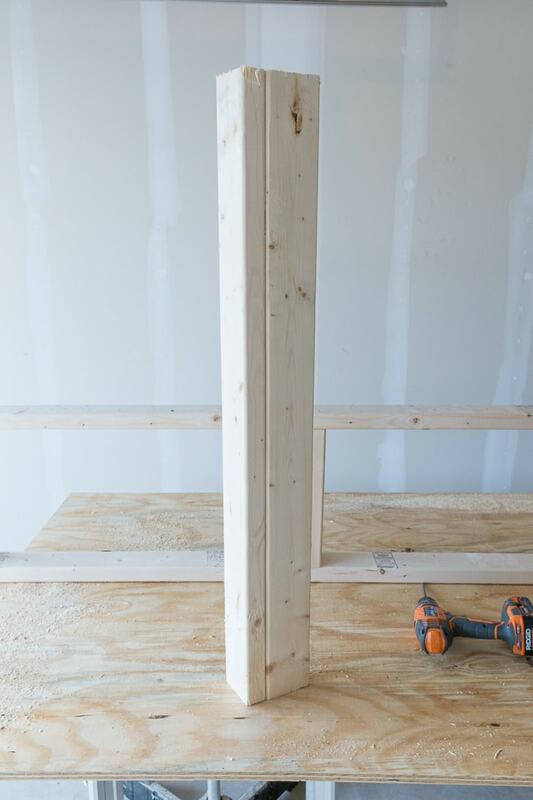 The bench needed to be long and lean to fit a little alcove on the side on our one-car garage. I wanted to break in my new Kreg Jig K4. It’s a tool for making pocket holes that I’ve wanted to try for quite a while. So I drew up some plans and gathered about $45 worth of materials—a sheet of plywood and 64 feet of 2×4 lumber. 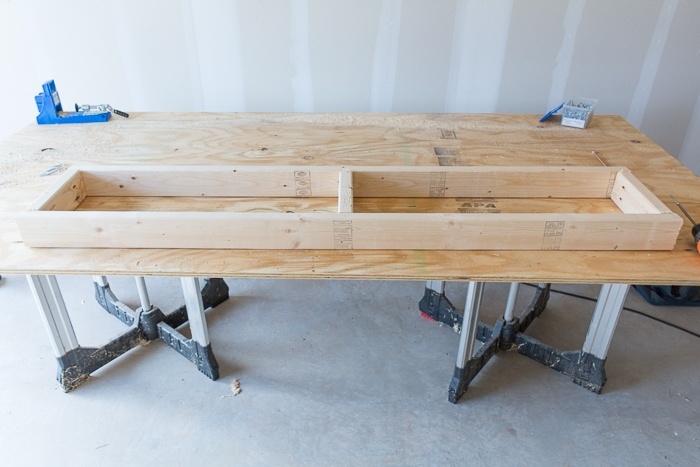 Yes, sounds like a lot of 2x4s to make a simple two-level work bench. Bear with me. It’s perfect. 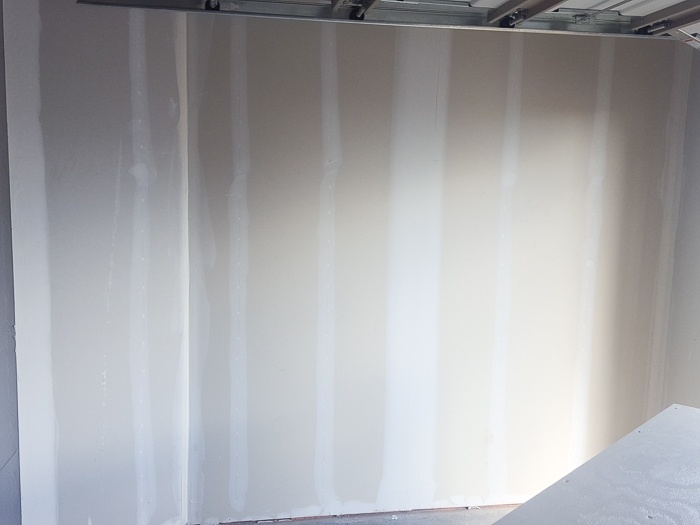 And that’s also the painted garage–using the same color we used on the living room walls, except we didn’t tint it at 50%. We also mounted a pegboard to organize some of our odds and ends. I love it! 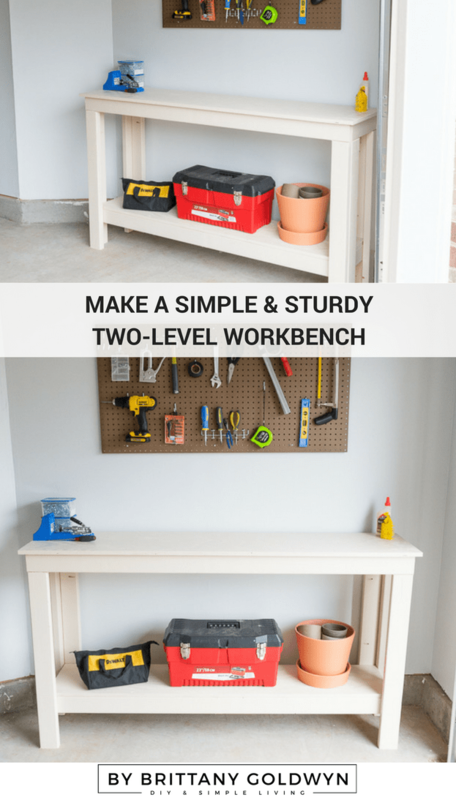 And here’s how to make a simple two-level workbench! Step 1: Build out the frames. Once you’ve made all of your cuts (remember, measure twice, cut once! 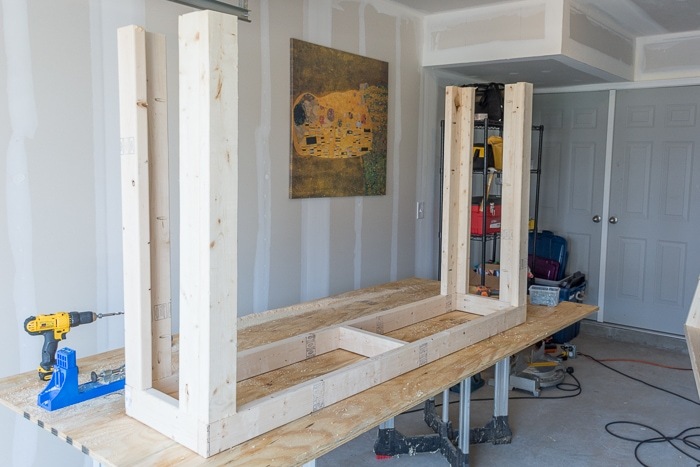 ), start by building out the frames for each of the two levels. While one frame is bigger than the other is, they are both constructed in exactly the same way. I like to lay everything out to visualize it. 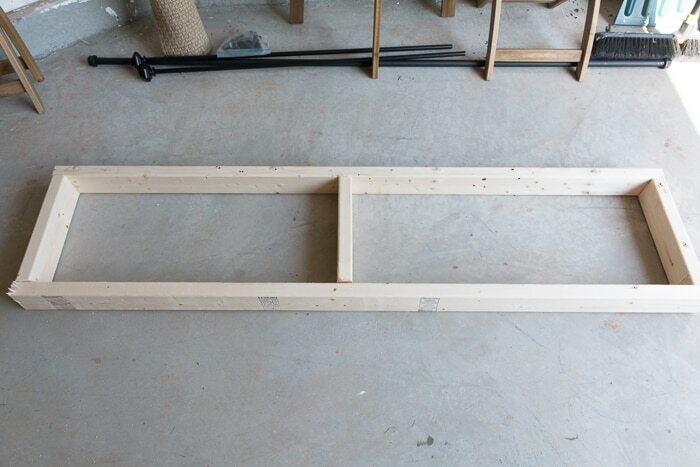 I worked on the top frame first, so I grabbed the (2) 68″ pieces and created a frame using (2) 13″ pieces. Then I took the remaining piece and put it in the center for support. To help me remember which sides of the 13″ pieces I wanted to drill pocket holes on, I made small marks. 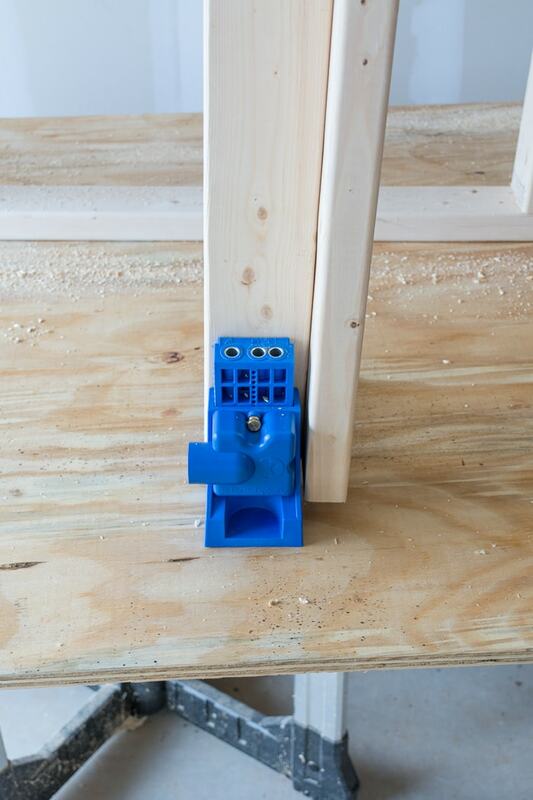 Then, I used my Kreg Jig K4 to drill (2) pocket holes on the ends of each of the 13″ pieces. Once I’d drilled the pocket holes, I attached the 13″ pieces to the 68″ pieces using 2 1/2″ pocket hole screws. You might be wondering—why pocket holes? 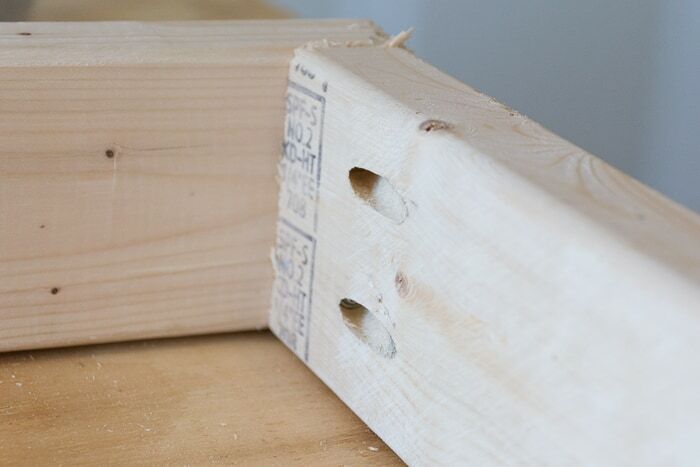 Pocket holes allow you to join pieces of wood in a way that hides your screws in areas that aren’t visible when your project is finished. 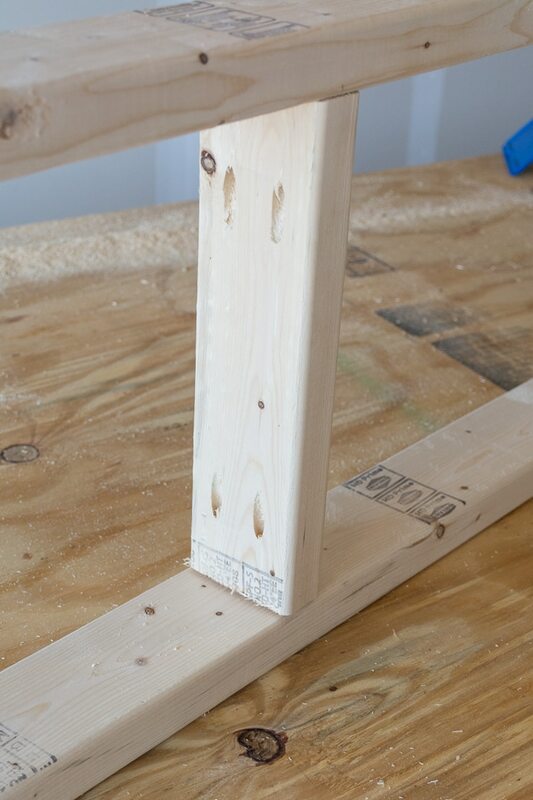 The pocket holes also create a super strong joint, which is critical for something like a workbench. Follow these same instructions outlined in Step 1 to construct the bottom frame. Step 2: Build your legs. You’ll join (2) 36″ pieces of 2×4 for each leg, creating four legs. Use pocket holes to join each set of two pieces from the inside: I created (3) pocket holes, one near the top, one near the middle, and near the bottom. Step 3: Attach the legs to the top frame. Drill a pocket hole in the top of each leg. 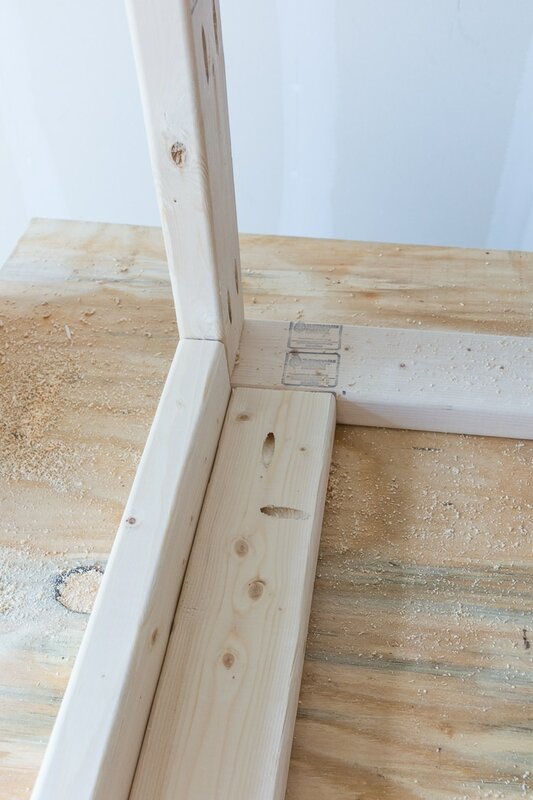 You’ll drill up through this hole to attach each leg to the larger of the two frames. 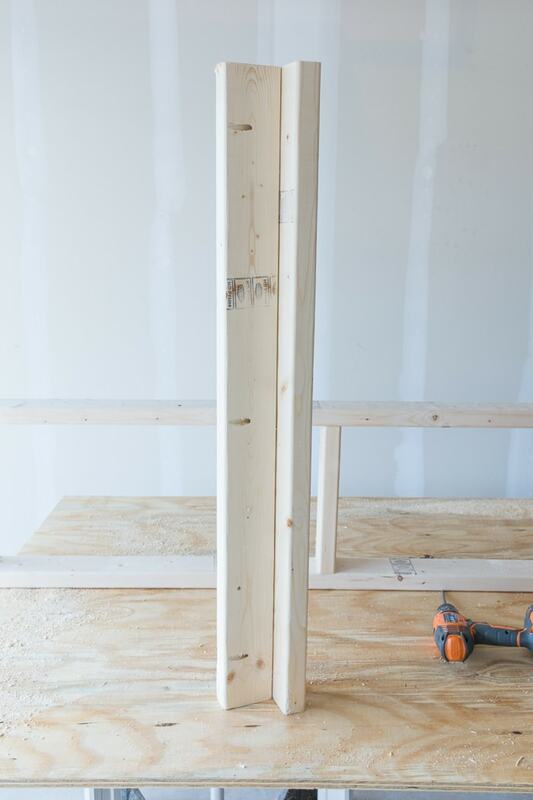 Then use 2 1/2″ pocket hole screws to drill up through the pocket holes and into the bottom of the top frame. The legs will be flush with the frame. For the rest of this tutorial, head on over to Kreg’s fantastic new DIY project plan site, BuildSomething! Brittany, this is awesome! We just purchased a Kreg Jig Mini and we are in looooove with it!! Sure, we can only do one pocket hole at a time but, who cares when they’re so fun to make 😉 Pinning and sharing!! Thank you so much Angie!! Yes, this was my first Kreg Jig project, too! I was a little nervous about it, but it was super easy…I’d love to do another piece soon! I’ve been thinking about making making a wine rack…maybe that will be next?! I’m still partial to metal workbenches. However, you have done a wonderful job with yours and I appreciated the tutorial. I may have to build one of these for my garage to have in addition to my metal workbench. You can never have too much space to work on. Thanks, James! I’ve actually never used a metal workbench. I love this one, though, and am already trying to figure out where I have room for another work bench. 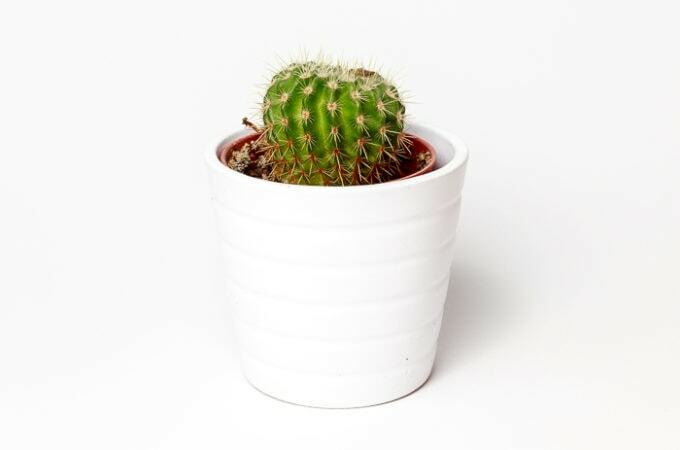 You’re right about work space…you think you have enough, and you quickly outgrow it. great DIY and wonderful to meet you on craft schooling Sunday! 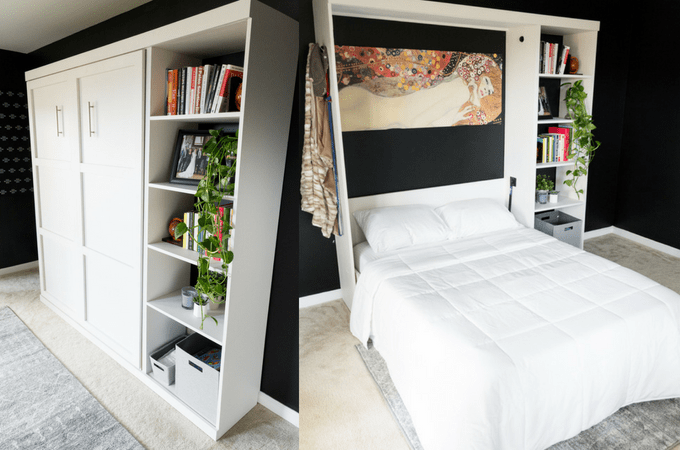 This is great – I love a simple building plan. I’m going to make one of these as a potting bench. Thanks for the inspiration and cut list! Thanks Kate! This would be an awesome potting bench, and it’d be so easy to scale the measurements up or down! Terrific! 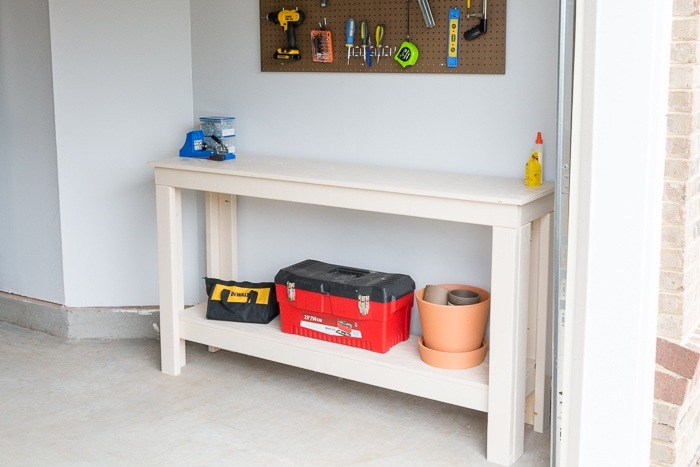 every home needs a workbench. This could be used as a sideboard or sofa table or any table/bench! Thanks for the instructions and tutorial. Thanks Linda! I’m so excited to finally have a garage–we haven’t definitely put this new bench to good use! 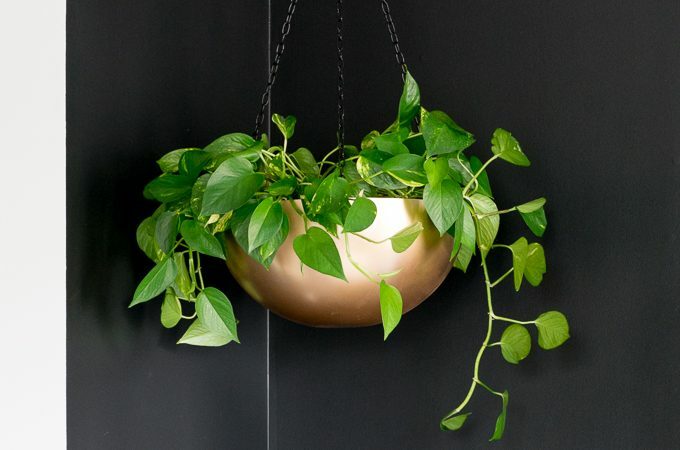 This is lovely and what a functional piece for your garage! Your directions and pictures are detailed as well, and makes it even easier to follow. Thanks so much for sharing this with us on #shinebloghop this week! Thank you Maria! I love it and use it every single day!! I love this bench Brittany! I am all for anything I can build myself and this looks like it would be pretty easy! Thank you so much for sharing it at our Inspiration Galore Project Party last week. You are one of my Features this Sunday over at http://www.recreateddesigns.com. Pinned and shared. Have a great weekend! Thank you so much Lisa!! I am honored to be featured! You have a great weekend, too. Thank You so much Brittany, yesterday I was cleaning my basement and found some of the stuff and planning to throw in the garbage. 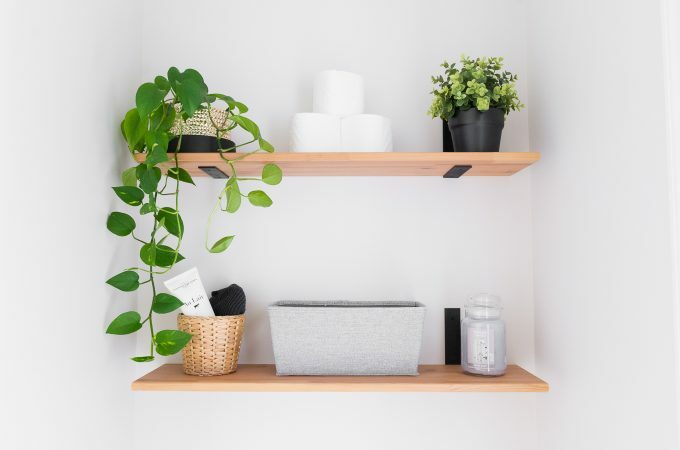 Today I saw this post just for searching what to do with those stuff and get the idea to create a new bench for use. I will try to use the above process hopefully it helps. Thanks Alot.